Reform is very much in step with Church thinking at this time, due mainly to the agenda set by our current Pope Francis who is working tirelessly for change, not least in the Vatican itself. The pace he has set has been remarkable. But change requires grass roots support, from people who are prepared to keep in touch with the issues and to encourage our Church leaders here in Ireland to be courageous and open to the wind of the Spirit at this time. This is what the ACI, with your involvement and support is trying to encourage. 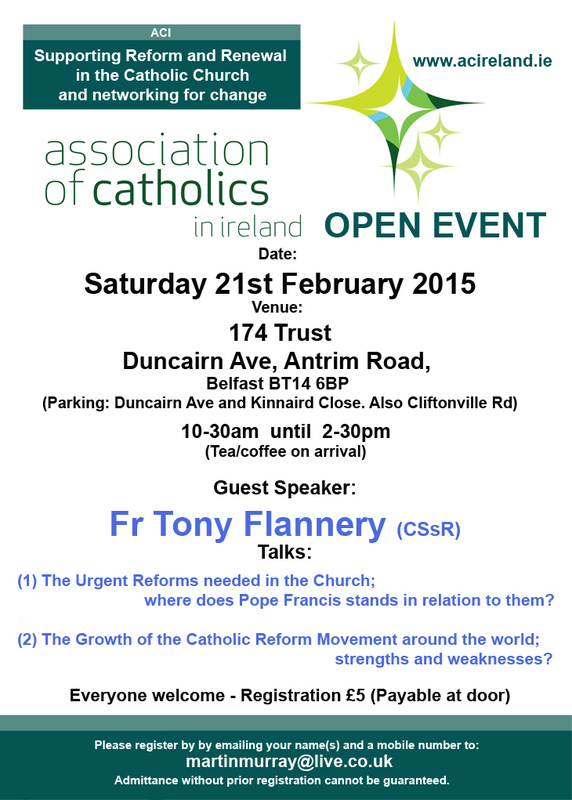 Fr Tony Flannery as a priest, writer and a founding member of the much respected Association of Catholic Priests in Ireland (ACP) has been an advocate for reform for many years, long before it was an acceptable or popular topic for Catholics. He has recently returned from a five week, 18 city speaking tour in North America to which he was invited by a network of American Catholic Reform groups. He will have had much time to reflect on the pressing issues currently facing the Church and will have gained many insights about reform efforts in the Catholic Church worldwide. The venue for this event is the beautifully restored church building, now a peace centre, called the 174 Trust, Duncairn Ave, Antrim Road, Belfast BT14 6BP. Doors open at 10-30am for a 11am start and the event will finish for 2-30pm. (See photos below). You can register for this event, or receive further information by emailing your name(s) to Martin Murray at:-martinmurray@live.co.uk A telephone number would also be helpful. Admittance without prior registration cannot be guaranteed. Unlike the first meeting, a registration charge of £5 is required to help cover expenses. This is payable at the door on the day. We do hope to see you at what promises to be an interesting and enjoyable day. Life out of Ministry	Launch of Angela Hanley’s Book: Whose A La Carte Menu?